It’s suddenly 2018. Have you set an awesome writing goal for yourself this year? I have, and I’m incredibly excited about it! For some of us, that goal involves writing something brand new. But for most of us, our 2018 writing goals probably involve rewriting a work in progress. It’s a draft, roughly complete or unfinished, that never seems to be “done,” no matter how much we tinker with it. There’s a reason we get stuck in these perpetual works in progress. And if we don’t figure out how to overcome it, we might find ourselves in the same sticky mess 365 days from now. In secondary school, we are taught the writing process: Plan, Draft, Revise, Proofread, Publish. As a secondary teacher, I face the most resistance from my students in that third step: Revision. The first reason why is that we simply don’t want to do it. Revision isn’t nearly as enjoyable as creation, or as easy as correcting surface errors. Plus, it can be overwhelming, leaving us wondering if we even know how to revise a story. But the second reason why we resist is the word itself, “Revision.” It’s a misleading term. It doesn’t really exist. What we really have to do when we revise is rewrite. And no one wants to rewrite, because rewriting is painful. To properly revise, we have to identify that our existing creation is deeply flawed. And while it may have been beautiful once before, it is negatively affecting the story around it. Much like the Demo Day scenes in our favorite HGTV shows, we can’t simply work around the flaws. They’re affect everything else too directly, and have to be taken out with a sledgehammer. Revision can literally feel like betrayal and death, because we have to accept that our creation, something that we have lovingly cultivated, must be destroyed. Is it possible to keep parts of our old creation and rebuild around it? Yes, but it’s surprising (and depressing) how seldom this works. Odds are, if a chapter, paragraph, or sentence isn’t working, it has to go. Not sure how to revise? Start by removing the parts in your story that aren’t working. Here’s the good news: Our creations don’t literally have to die. Instead, they should get added to a “storage” document. When I was writing my novel, The Bean of Life, I was swinging my editorial sledgehammer like Chip and Joanna after drinking a case of Red Bull (my wife watches a lot of Fixer Upper). Yet every one of my beautiful creations, my little narrative children, was carefully cut and pasted into my “TBoL Storage” document. For each stored bit, I labeled it with a bookmarked heading so I could easily find it if needed. And you know what? I used it. There were many times I went back into that document and rescued a sentence or phrase that still had a role to play in the story. But to be honest, I don’t remember 95% of those bits in that storage document (which is 50,000 words long). I’ve forgotten them, mostly because they were ultimately forgettable. So here’s a tip for how to revise your story: do yourself the loving favor of protecting your creations. Never hit the “Delete” button (unless it’s just a typo). Always cut-and-paste your creations into storage, where they will be safe. To truly revise our work in progress and bring it to a state of “done,” we must rewrite it — often from a blank page one. This doesn’t sound fun, and it will certainly be a lot of work. But this new creation won’t feel anything like the first time. A first draft is like hacking our way through dense, dangerous jungle. This draft will be like climbing the stairs of an ancient temple where an enlightened monk awaits us at the top. Here’s why you need to rewrite on a blank page: A crowded page is a prison; a blank page is freedom. Trying to work within the confines of our old ideas and rigid prose does not provide the creation freedom that we need. We need space. We need opportunity. Maybe a blank page is something you find intimidating. No problem. Keep an important piece of description, or a line of dialogue, to spark your creativity. Give yourself a launch pad. But remove the shackles of yesterday’s ideas. It’s a new year, a time for new ideas. And it’s time for a major breakthrough on that perpetual work in progress. Ready to rewrite? Start fresh from a blank page. Every old draft is a massive lesson that teaches us about our stories. The fact that we didn’t “get it right” doesn’t make us failures — it makes us artists. Art is failure of a very persistent nature. Some of the best pieces of art in the world were regarded as failures by their creators and contemporaries, and now are revered and copied. So (re)write this year with confidence! If your goal is to build the habits and mindset of a successful storyteller, this is a crucial step to take. We have to be able to put old ideas aside, learn from them, and take risky steps forward. Otherwise we will be stuck in a prison of the past, forever fearing the touch of the creative sledgehammer and its wonderful power. What do you think? 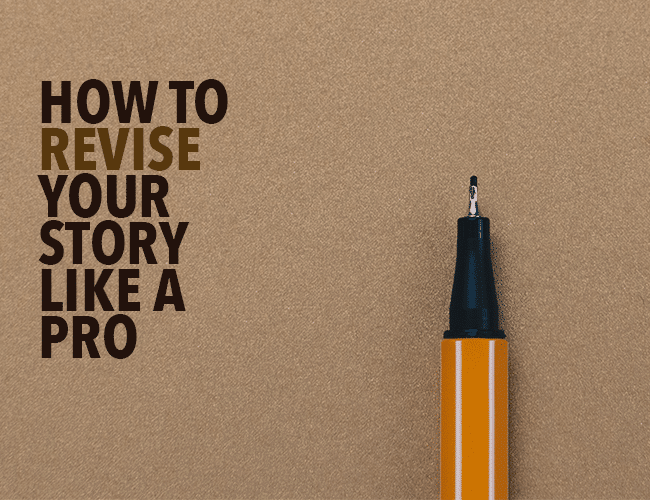 Can you revise, even on a crowded page, filled with old ideas that might not be working? Or do you prefer the freedom of an empty page of unlimited possibility? What steps do you take to revise your stories? Let the community know in the comments! Take a section of a work in progress that you want to “finish” in 2018, or at least take to the next level. Read a paragraph or page of it that you would like to revise. Then, for fifteen minutes, completely rewrite it without looking at it once. Share your revision in the comments. Then, add a thought on how the experience felt for you. Was it empowering? Terrifying? Did it give you ideas for future revision of your WIP? No matter how it goes, have fun exploring an old idea with new freedom! And if you share, remember to leave feedback for your fellow writers!